Marty Lipp talks with Matt Glaser and Margo Leverett about their explorations into bluegrass with global perspectives. Suddenly, bluegrass comes in an array of colors. The mountain music achieved crossover status with the wild success of the soundtrack to the film "O Brother, Where Art Thou?" but a small number of artists in recent years have been tinkering with the formula that they say has become too doctrinaire. These new rebels dove into the deep mountain waters of bluegrass and came up with some tunes that purists might turn up their nose at, but perhaps Bill Monroe himself might recognize as dear and not-so-distant kin. Not only have American artists been reinventing the genre, but even some Canadian traditional musicians have jumped the border to take a few tunes out for a spin. Is this the second bluegrass revolution? "The music has turned into something very different from what Bill Monroe, I think, envisioned," said Matt Glaser. "It was a wild and dark kind of music that was not about technical perfection. A lot of bluegrass now has become this incredibly slick thing." Matt Glaser, who heads the string department at Berklee College of Music, has played both jazz and bluegrass in his career. Recently, he gathered some like-minded and talented musicians to produce This Train (Rounder), the second album from the Wayfaring Strangers, a somewhat ad hoc group that pushes the boundaries of bluegrass with the free-roaming spirit of jazz. The origins of the band, Glaser said, came from a health scare that he had several years ago. "I wanted to make music I could listen to on my own deathbed, not to get too morose about it," he said. "There seemed to be a lot of music that didn't seem to be deathbed-worthy to me." While he loves jazz, Glaser said, many of the songs in the repertoire "are light on the existential message." Bluegrass, he added, "gets right to experiences that people know, that are meaningful." While some might see as bluegrass being a "pure" music that should not be tampered with, Glaser said, "the music started as synthetic music, where one person's vision brought together different musical elements. Monroe, he said, took from musical styles as disparate as blues and polka, string band and mariachi. Bluegrass, Glaser said, "started as this wild, hair-raising thing. People were having heart attacks from listening to Earl Scrugg's banjo-playing." His goal with the Wayfaring Strangers, he said, was to take the soul-touching messages of bluegrass songs and "open them up a little bit." Working with an eclectic band and guest musicians such as noted klezmer performer Andy Statman and singers Ralph Stanley and Lucy Kaplansky, the Strangers' first album set out from the rural South and went all over the map. For the second album, the Strangers also added the spirituality of gospel to the mix, which helped to make the overall sound more upbeat. At first glance, it would seem that there could hardly be two more disparate genres than bluegrass from the rural southern U.S. and klezmer, the music of the East European Jewish ghetto, but The Klezmer Mountain Boys show that they could be seen as spiritual cousins with some interesting, if coincidental, similarities. Margot Leverett, who was the original clarinetist with The Klezmatics and has now organized the Klezmer Mountain Boys said, "Both kinds of music have that mixture of laughter and tears. "They complement each other," she continued. "They bring out something in each other you might not otherwise notice." Leverett said that just as rural music in the southern United States was studied and preserved by northern academics, old tunes from the southern part of the Soviet Union were studied by northern ethnomusicologists there. Several of the tunes on the Klezmer Mountain Boys eponymous album on Traditional Crossroads are from Leverett's tour several years ago with visiting Russian musicians who had discovered the old tunes, which had been declared illegal during the Soviet era. Inevitably, when the Klezmer Mountain Boys begin a live set and suddenly shift from klezmer to bluegrass or vice versa, the audience begins to laugh. Leverett acknowledged that the juxtaposition is unusual enough to provoke giggles, but at the same time the band and the music is serious. "It's funny, but it's not a joke," she said. The group was created after Leverett began thinking about playing clarinet in a string band context and then contacted an old friend, mandolin player Barry Mittlehoff. 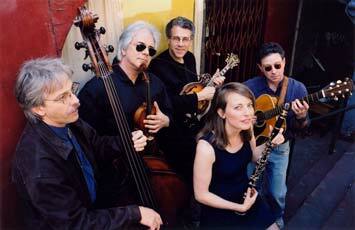 They then assembled players who had experience in both klezmer and bluegrass. The group's first get-together was cancelled due to the attacks on the World Trade Center, but the tragedy also had a profound effect on the musicians. They were barely up for playing, much less playing the joke-y juxtaposition of which they had been talking. When they finally did get together, Leverett said, "the fun idea was just gone. This was something altogether else. It was really soulful and it was really deep." Other recent, though less surprising bluegrass hybrids have included songs done by Canadian traditional musicians. Natalie MacMaster, a fiddler from Cape Breton, calls her latest album on Rounder Blueprint, which was recorded in Nashville and has a guest appearances by bluegrass musicians, including Bela Fleck. Another Canadian violinist, April Verch, who is from Ottawa studied at Berklee with Glaser and on her latest, From Where I Stand, on Rounder, she also jumps south of the border. Glaser said that though bluegrass, like many revolutions before it, has to some extent become "codified and ossified," he is encouraged by the new interest in roots music. "Before the advent of the industry, commercial music and all that crap," he said, "[Music] was something real in people's lives that served a real function and the music itself was very real and deep." He described Ralph Stanley's appearance on The David Letterman Show, singing "Oh Death" a capella was a seminal moment and a signal that something is up. Every so often, he said, "something real creeps through American society....Hopefully it's a sign that people are thirsting for something real musically, that's nourishing."